Further to our tribute to Fred Pearce on becoming the RWA President here is a lovely personal note from Chris Bolton, number 17 in the above photo, of which more later. Many congratulations to Fred on becoming RWA President, an honour richly deserved. I first met Fred in June 1957 when I stood next to him at the start of the Lancashire County AAA Junior One Mile Track Championship. I had to stand next to him since there were only two competitors! My next race was the Manchester to Blackpool walk four weeks later where I again finished last, in 11 Hours 3 Minutes. Not an auspicious start to Race Walking. Since then I am pleased to say that Fred and I have had almost 60 years of friendship. Once again many congratulations to Fred. As for the photo above of Chris in the final stages of the 1962 Manchester-Blackpool walk held on June 30 there lies another story. For five years after finishing last Chris was to place 4th in 9:12:46 behind the legendary Hughie Neilson [Woodford Green], Norman Hopkinson and John Eddershaw [both Sheffield United Harriers]. 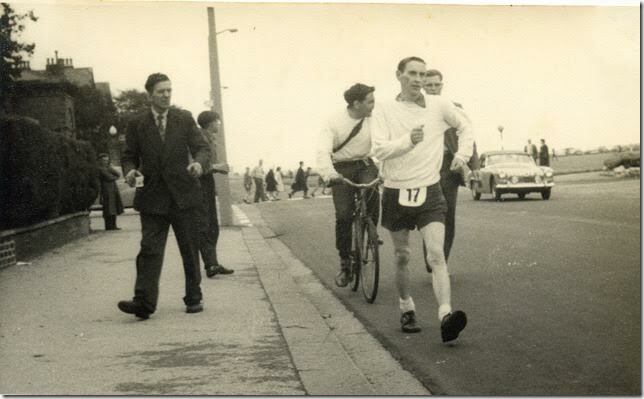 Amazingly just six days later he placed 17th in the Leicester -Skegness 100 miles, dead-heating with Brian Howarth [Leyland Motors] and Paddy Dowling in a time of 22:09:27. All three were new Centurions with Chris number 332. And our great friend Guy Goodair in the colours of Wakefield also became Centurion 327 in the same arduous event, 10th in 21:07:00. It’s worth noting that Chris finished 15th in the Bradford 50k in 5:22:42 on June 11. In the space of just four weeks Chris raced 293 kilometres, give a centimetre or two! As the photo itself reveals I was helping out as a flying feeder. I’m half-hidden, standing on the pavement, behind the besuited bloke. That month I’d placed 2nd in the Leigh Harriers 1 mile championship behind Jack Sankey [7:34.4] and in front of my dad. The result with no times for us records 2nd A.J. Taylor Jnr, 3rd A.J. Taylor Snr. Shades of Fred and his father. Meanwhile Campbell McNinch, who is on the bike behind Chris had finished 9th on June 12 in the then famous Sheffield Star Novice Walk over 11 and a half miles. The race was won by Mal Tolley of Sheffield, a future GB international and one of the stylists of his day, in a record 1:39:15. This entry was posted in History, News and tagged Centurion, Chris Bolton, Fred Pearce, Leicester - Skegness, Manchester - Blackpool. Bookmark the permalink. Campbell McNinch – blimey I’d forgotten all about him – what happened to him?